Payments of all copays, deductibles, and/or coinsurance are due at the time of service. As a service to you, our office will bill your insurance company. Being a participating provider with most insurance companies, the insurance companies require that we collect these fees, as they are terms of your health care contract. Additionally, patients are ultimately responsible for all balances. For your convenience, we accept credit cards including Visa, MasterCard, American Express, Discover, and Debit Cards. Due to the constant changes in health insurance it is your responsibility to know your health coverage. If you should have any questions regarding if a certain procedure is covered, it is to your advantage to call your insurance company and find out exactly what your contract covers. Their customer service representatives will be happy to assist you. You will be charged a $25 fee in the event that you don’t cancel your appointment within 24 hours or you don’t show for your scheduled appointment. If you wish to release your records to another physician or someone else, you must sign a release with that office. They will notify us and we will process the request. Most requests are handled in seven to ten days. The doctor will be delighted to fill out any medical form for patients. However, ample time must be given. It will take approximately one to two business days for the forms to be completed. There may be a charge of up to $20.00 per form. 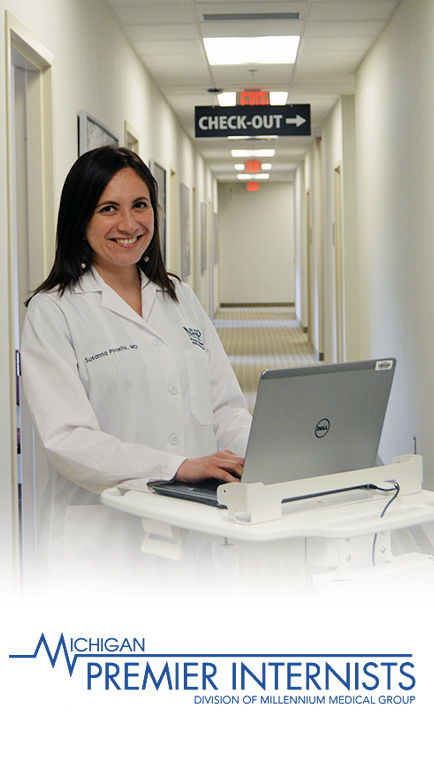 Michigan Premier Internists’ mission is to provide you with the highest quality medical care possible. With this in mind we are constantly trying to control our costs while conforming to the standard fee schedules approved by most major insurance companies. Your trust is very important to us and our Practice is strongly committed to protecting your privacy. We have created the following Privacy Statement to give you an overview of the type of information we collect, how the information is used and how the information is safeguarded. Our Practice may make changes to the Privacy Statement at any time. If we do so, we will post those changes on our Website so you are always aware of what information we collect, how we use it, and under what circumstances, if any, we disclose it. Please review our Privacy Statement periodically to see recent changes. Our Practice may disclose information you provide to us to independent contractors, service providers and consultants who assist us in providing healthcare services to you via our Website. Such service providers may include, without limitation, credit card processing and shipping companies. However, we will only share such personally identifiable information, as we deem necessary for them to carry out their obligations to our Practice. We may also share aggregated demographic information with independent contractors, service providers, consultants, and other partners. This is not linked to any personal information that can identify any individual person. Our Practice may also disclose personal information it has collected if necessary to fulfill our service obligations or if we are required to do so by law, or if in our good faith judgment, such action is reasonably necessary to comply with legal process. Our Website may offer links to other Websites. Please be aware that we are not responsible for the privacy Practices of such linked Websites, including Websites of our partners. We encourage our users to be aware when they leave our Website to read the privacy statements of each and every Website that collects personally identifiable information. This privacy statement applies solely to information collected by our Website.